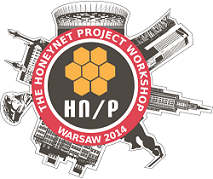 The Honeynet Project workshop will be held at The Adgar Plaza Conference Center situated in the Mokotów district – in the heart of a business part of Warsaw. This modern centre makes a perfect alternative to four and five-star hotels. It is an ideal place to organize conferences, trainings, business meetings, presentations and other events requiring top standards. The most convenient way of transportation is public transport. There is a train going between Warsaw Airport and Central Train Station located in the city centre. From the Central Train Station to the JM Apart hotel is about 10 min, 5 stops by bus or ~20 min walk. Going from Warsaw Airport to the Hotel will cost $1.5 by public transport, because just one 75 min ticket will be sufficient. Preferred hotel to stay during the conference is the JM Apart located less than 1.400 metres from the Central Station (“Warszawa Centralna”) and the Palace of Culture and Science, about 10 minutes walk from the "Złote Tarasy" shopping centre and only 500 metres away from the Warsaw Uprising Museum. The hotel is close to both the main administrative and business spots in Warsaw as well as to the major shopping centres of the capital city, among others: Złote Tarasy, CH Klif and Arkadia. In front of the hotel there is a Veturilo city bike docking station, where you can rent a bike in the period from March to November.